Tens of thousands of sixth form pupils were forced to wait an extra year before resitting their English and maths GCSEs because of reforms to the qualifications, it has been revealed. Ofqual said many of this year’s year 13 pupils who failed their English or maths GCSEs during the last year of the old qualifications in 2016 had to “complete a full year of study” before re-sitting the exams, prompting a staggering 94 per cent rise in November entries among that year group. 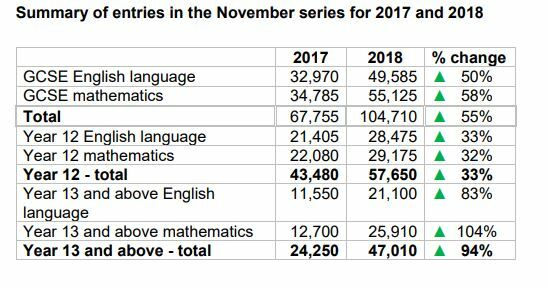 Data published today shows 47,010 pupils in year 13 or above sat a GCSE maths or English exam in November this year, up from 24,250 last year. November entries give schools an opportunity to enter sixth form pupils who failed their English or maths for re-sits. In previous years, pupils have been much more likely to re-sit their English or maths GCSEs in year 12, but changes to the exams in recent years has prompted a sharp rise in entries from older sixth formers. This year, 25,910 year 13 pupils sat GCSE maths in November, up from 12,700 last year, and 21,100 re-sat English language, up from 11,550. Ofqual says the rise is in part down to changes to GCSEs which saw tougher exams and a new 9 to 1 grading system brought in. This year’s year 13 would have been the last cohort to sit the old English and maths GCSEs in 2016, and subsequently had to “complete a full year of study before re-entering to take these new qualifications”, the regulator said. Since August 2015, full time students who don’t achieve a grade C (now a grade 4) or above in their English language and maths GCSEs have had to continue studying the subjects to meet post-16 funding requirements. There are also more pupils in year 13 and above this year, after a drop in numbers last year. 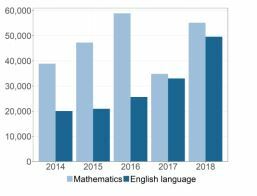 Although the number of pupils resitting English has grown steadily over the last five years, maths resits experienced a slump in 2017 compared to the year before. Ofqual has previously said the increase in 2016 was probably because it was the penultimate opportunity to re-sit the legacy specifications. Since 2017, the only available resits have been in the new qualifications. The number of year 12 pupils sitting maths and English GCSEs in November 2018 grew by a third this year, with 57,650 taking the exams compared to 43,480 last year. Overall, GCSE entries in November increased by 55 per cent. However, despite the rise in entries there was a drop in the overall number taking the GCSE maths higher tier exam, falling 17 per cent to 3,685. The number sitting the foundation tier rose 70 per cent, to 51,440. Overall, 93 per cent of all maths entries were for the foundation tier.